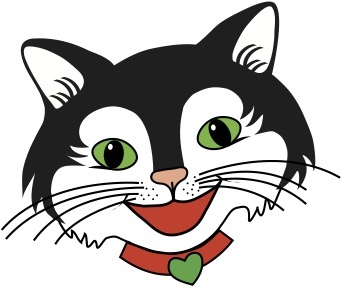 to download the Cat's Meow, Contact Access Database, in two versions. This file is 6 MB and might take 2-3 minutes to download. A pair of links will appear on your Desktop...each with a cat's face. linked to a dummy data file so you can see how it works. I recommend that you experience the practice version before working with an empty data file. Create or modify some records, run some reports, create a letter, view a mailing, and explore the Groups features. -- a not-yet-customized version of the Cat's Meow application --linked to an empty data file. When you're ready, use the Blank Application to place your records into the empty* data file. You may use Cat's Meow Application for free in either of the above, downloadable forms. These Application designs are protected and can't be changed. The Cat's Meow Application is copyrighted. Free assistance as you learn to use the database, and beyond. For non-profits who ask, I can arrange to come visit for on-site training. Please plan to set up free remote assistance training software so we can communicate effectively. Set up your account at www.logmein.com. Then invite me to watch or assist as you operate your computer. It is a service we have used for years and works well. Letterhead, etc designed to your specifications. Additional future changes to your forms, letterheads, reports, etc. Customization of the Application's functions to specific needs unique to your organization. A simple system -- one computer, one user at a time -- is easy to set up. Rarely do we feel we need to be on-site to set it up, so only rarely would we need to charge. A networked system -- enables sharing the database across two or more computers. This allows many users to access Cat's Meow Database simultaneously. We can come to your site to survey your existing network, determine the best strategy, and implement this system for you. We love to travel, so would not normally expect you to cover our travel expenses, however we do charge for our time on-site. Depending on your browser, you may have a choice of Run, or Save, or Both. If Run is an available choice, click it and in a minute or two the wizard should start running. Just click NEXT as the installer wizards you through the process. If you have to Save the file, take note of where you save it. You will need to find the file and double click to start the wizard. Do NOT change the location or pathway. → Download MSAccess Runtime, a free product from Microsoft. Choose AccessRuntime.exe (not the X64 version). Runtime is a larger file than Cat's Meow, does have an executable, and will likely take a few minutes to download. Don't download Access Runtime if you already have MSAccess installed. For the Microsoft Access Security Notice, you can click "open". For the "Echo Macro" and "Macro" screens, it is important to close them with the X in the upper right corner. See images of these warning screens, and details on how to permanently get rid of them on the Cat's Meow Documentation webpage, Security and Macros paragraphs.